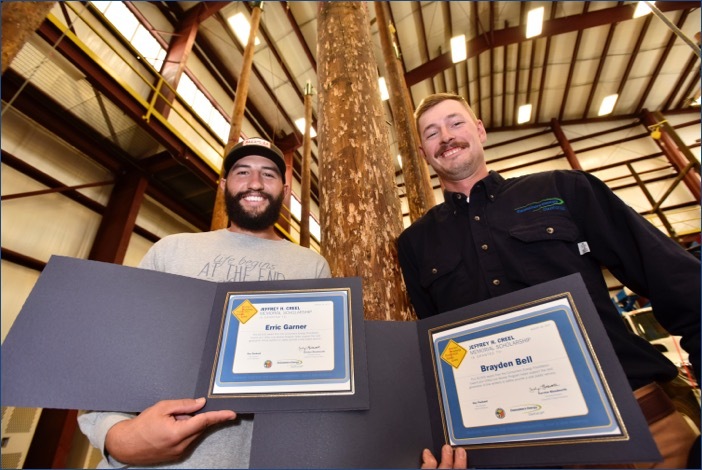 Erric Garner, left, and Brayden Bell were honored Thursday at Consumers Energy’s Marshall Training Center with lineworker apprentice scholarships in honor and memory of Jeffrey Creel, a Consumers Energy lineworker killed in the line of duty in 2012. MARSHALL, Mich., September 1, 2017 /3BL Media/ – The Consumers Energy Foundation is assisting two men training to become utility line workers as the second-year recipients of a scholarship honoring an employee killed on the job in 2012. The scholarship program, first announced in 2015, is in conjunction with Lansing Community College (LCC), Alpena Community College (ACC), the Michigan State Utility Workers Council and Consumers Energy. The 2017 recipients, Erric Garner of LCC and Brayden Bell of ACC, were honored Thursday at a ceremony at Consumers Energy’s Marshall Training Center. Packard thanked Robin Creel, Jeffrey Creel’s widow, for her participation in the ceremony and for her continued support. Students must be actively enrolled and in good academic standing in the Utility Line Worker Program at LCC or the ACC Utility Technology Program to qualify. Candidates must have successfully completed all requirements and be selected for enrollment into the 10-week courses delivered at Consumers Energy’s training facility in Marshall. Annually, each college will select one recipient, who will receive a one-time $2,500 payment toward their educational expenses. Bell, of Cedar Springs, recently completed the 10-week course at Marshall and has accepted a Step 1 lineworker apprentice position at Consumers Energy’s Norton Shores Service Center. Garner, of Jackson, is currently enrolled in the 10-week program. As with other industries, Consumers Energy has a veteran workforce and attracting individuals to learn a skilled trade is very important. “This scholarship provides an opportunity for individuals to learn this essential trade, and we’re pleased that Jeff’s name and Consumers Energy are associated with it,” said Pat Dillon, president of the Michigan State Utility Workers Council. Consumers Energy’s continued focus on roadside safety comes as the number of traffic fatalities across Michigan remains significant. In 2016, 1,064 people lost their lives in Michigan traffic crashes. So far in 2017, the number of fatalities stands at 642. Thursday’s announcement serves as an important reminder of safe driving for the upcoming Labor Day Weekend, when more than 1 million drivers are expected to take to the state’s highways. The Consumers Energy Foundation is the philanthropic arm of Consumers Energy.The foundation provides grants and mobilizes volunteers to strengthen local education, social services, the environment and community, economic and cultural development. Michigan nonprofit organizations received more than $13.5 million in contributions in 2016 from Consumers Energy, its employees, retirees, its foundation and parent company CMS Energy.